At least it’s so cold there’s no mud. Construction on the border wall has halted for the winter. The whole thing has been shaped and smeared with a nice layer of topsoil, and all that’s left to add is a row of spruce along the top. Dark, gloomy, rooty, overbearing spruce that shall eventually loom over my sunny garden. As you can see I’m still trying to be optimistic about it all. We’re home today waiting for the snow to fall and that seems like the perfect time to get in a few pictures and celebrate an anniversary. 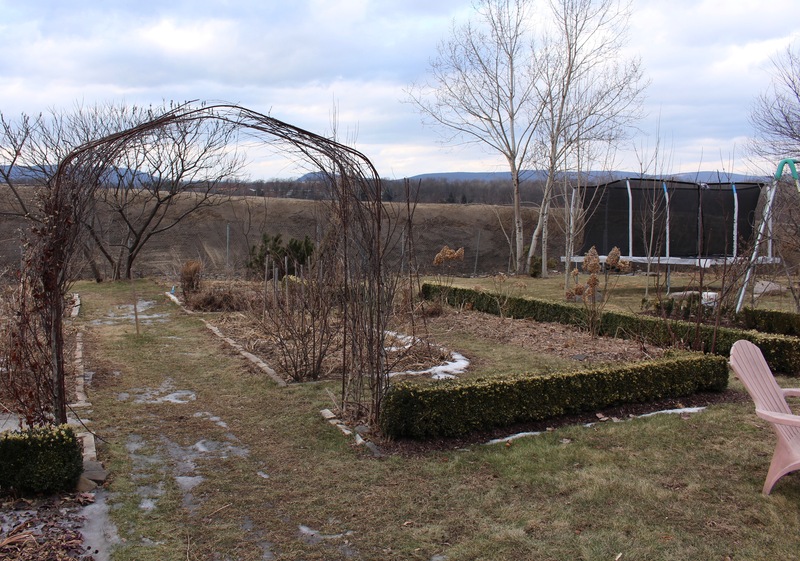 For me January is an agonizingly slow gardening month, and apparently that was also the case six years ago when in a moment of boredom I found out just how easy it was to start a free online blog through WordPress. Six years and six thousand snowdrop pictures later I’m still here and although the heyday for blogs seems to have peaked and waned I’m more than happy to keep going on more than I need to about my somewhat suburban, somewhat middle of nowhere Pennsylvania garden. The only bit of winter interest I could find in the bleak and cold garden. 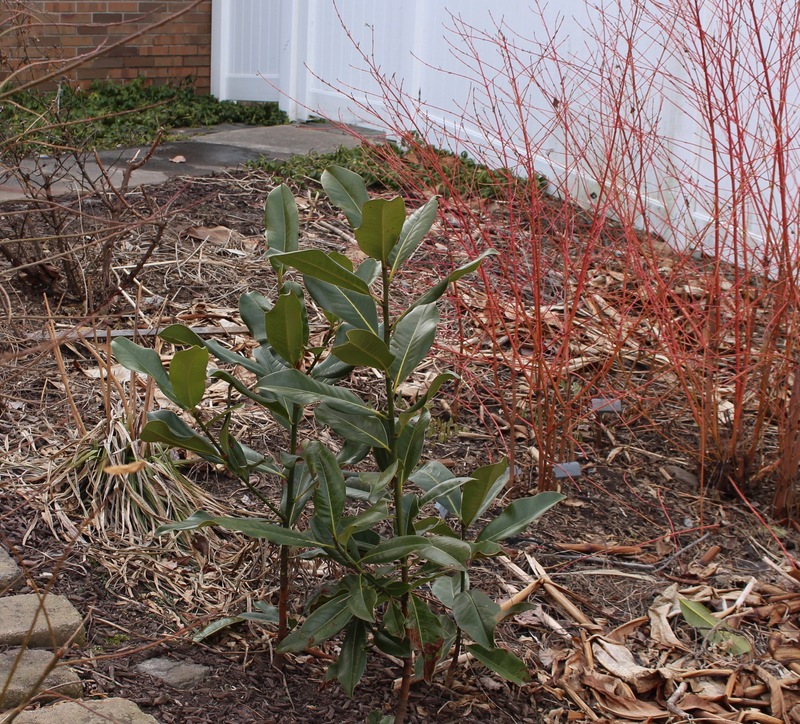 The red twigged ‘Midwinter Fire’ dogwood will be fine in this week’s arctic blast, but all bets are off on the Southern magnolia seedlings. There’s like three cyclamen in bloom when there should be a tray-full. But at least it’s clean since the seed saving mess is all packed up and off my little man-cave table. Since the winter garden is kind of a flop this year, my natural response is to go all out and make it even bigger! The area which hosts my grow area was originally built as a workshop, and I’d been using it for tools and storage and some of the messier projects, but enough of that. After these pictures were taken I hauled everything home-improvement and woodshop related out and started moving lights and tables into hopefully “better” spots. 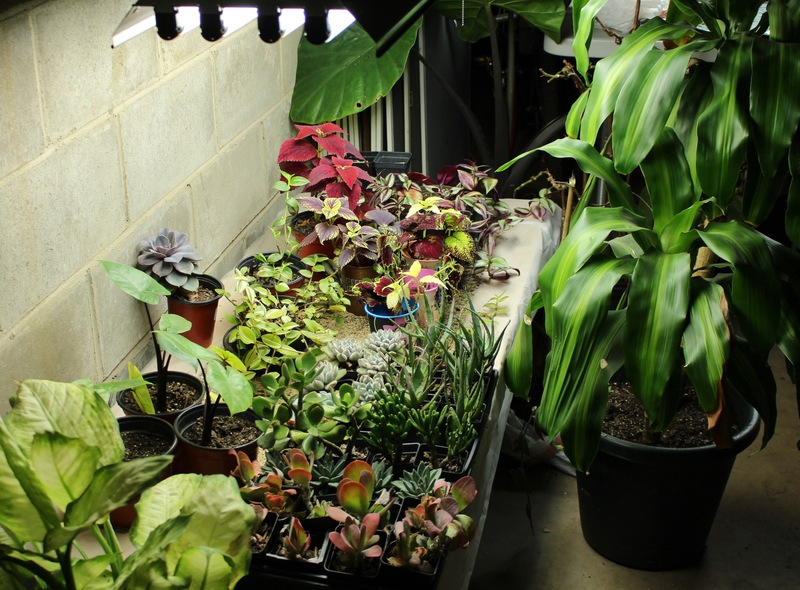 Most is still a complete mess but at the far end of the back room, near the furnace where it always stays warm, I’ve already set up two lights for the coleus and other goodies which need a reliably warm spot. Kind of prison cell-block looking, but the plants don’t seem to mind. Hopefully in a few weeks things will grow and I can move a few under the second light table (not really visible in the back) and make this area a decent growing spot. There are still a number of little things I have to deal with in the main (colder) area such as a leaky foundation, burst water pipes, and electrical issues but I’m sure that will just clear up practically on its own and I’ll be planting again in no time. For now though it’s keeping me off the internet and slowing down my new-plant-buying compulsions that all gardeners face at this time of year. I did not buy this, and in my book that almost counts as saved money… and if you keep with that logic approx $1,500 US would make for an excellent plant budget! Maybe in a few weeks there will be something slightly less depressing to look at in the winter garden. Most years this is a pleasant hideaway to escape the cold and brown that lurks outside but so far the winter of 2019 is still a work in progress. We’ll see though. It’s remarkably easy to fill up these light tables and come to think of it there are still a few potted primula outside that I could probably chip out of the ice and drag inside before the snow and cold become too unreasonable. Hmmmmm. 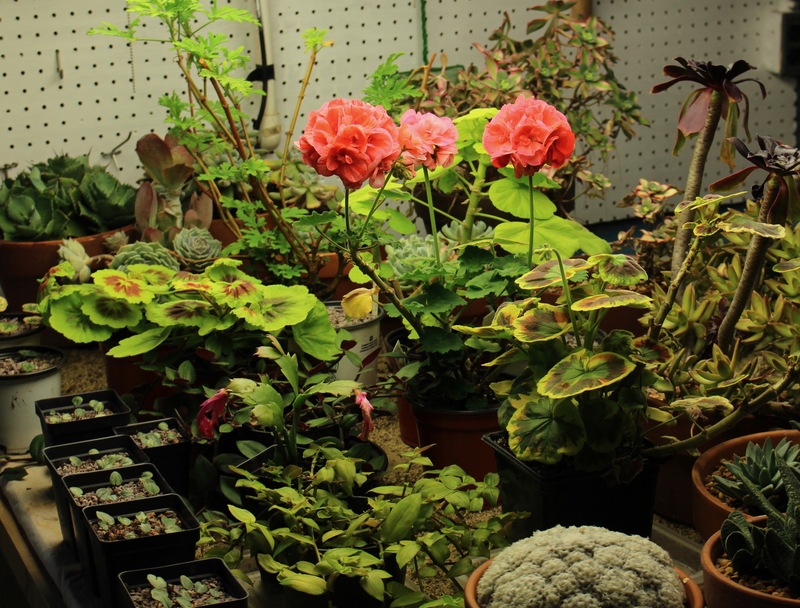 This entry was posted in growing under lights, overwintering tropicals, winter flowers and tagged growing under lights, pennsylvania garden, winter garden. Congratulations on your blogiversary. Six years! I wonder when I first caught up with you? It’s snowing here and I have some coleus under lights in the basement that look kind of funny, and I wonder if the basement is just not cold enough for them. Thanks Kathy! I know I came across your blog long before starting my own, but I’m not sure when we finally ‘caught up’. I bet it’s been a few years already! The warmer the better as far as coleus go, mine will fade away if left in the cooler parts of the garage. Maybe it’s the lights? Mine look different under lights vs outside, and even look different depending on which lights I use. A better grower would try and figure out what it is, I suspect it’s either the light makeup or the intensity since I usually mix up all kinds of fluorescent bulbs. I am so happy that you continue to blog. My favorite place to be is in blogland, especially when I can read about wonder-full gardens like yours. It is such fun to see what people are up to in their gardens. You write so well it is certainly a pleasure to read. I even like reading about the failures and let downs in other gardens. It makes me feel almost normal. 😉 I am amazed that you can grow primroses. I have tried them but I must not have the right conditions. I hope to try them again sometime. I have been starting to utilize an area of my garden that isn’t crammed full. I have found that it has hosted several plants I have had trouble with in the past. Hmmmm sounds like a blog post coming soon. Do, PLEASE, keep up your blog. Especially since the dramatic new wall is going up. There will be lots of changes no doubt. Think of it as some fun changes. I will hope for the best for you and your garden. Your man cave/basement looks good this time of year. At times like this I wish I had a basement. Enjoy your day off. Thanks Lisa! That’s so nice of you to say, and just like you I always enjoy keeping up with garden blogs that keep it “real”. It’s more like a visit then, rather than just some more pretty pictures, and who doesn’t like visiting and hanging out with other gardeners!? Primroses are really just long lived annuals here so don’t be too impressed. There actually is one that seems to handle the far from perfect conditions a little better than the rest. The cowslips (primula veris) are less fancy, but I haven’t had any die on me yet. Some are actually spreading! I must have found you quite early on. I always like seeing your winter garden, I thought my outside room (currently known as the orangery) would host some tender plants but I’ve been too mean to have the heater working on higher than frost free. I’m going to look at some LED grow lights now, I think they could be very helpful. Congratulations on 6 years. Thanks Christina. Your citrus are what I love to see, those and the forced tulips are how I imagine your orangery to be on every day of the winter! I know that’s not the case, but you’re fortunate to be able to have something green in there all the time even when it’s kept just barely above freezing. I may also try the LEDs. They’re still fairly expensive here and seem more complicated as to wavelengths and getting the light quality just right, but in the long run I think it’s the way to go. Happy blogiversary, Frank! Six is impressive. It’s a pity that they aren’t planting a mix of things on your ‘border wall.’ It would look more natural and wouldn’t block your light and air flow. I always wonder who designs these things! Thanks Eliza. I think their “design” for the plantings follows what they’ve done with the rest of the industrial park. It’s all serviceable enough, but far from a horticultural celebration! This seems to be a good week for blogoversaries. I love your posts. Keep ’em coming. Thanks John, and congratulations on your anniversary as well! I’ve been keeping up but usually it’s on the go so less of a chance to comment. Glad to see you’ve settled in to the new place enough to get back to posting! I think the garden blogging world is greatly enhanced by your presence, Frank. Keep up the great work, please! I find light tables always too easy to fill up as well. One of your areas looks cozy with that table and chair. 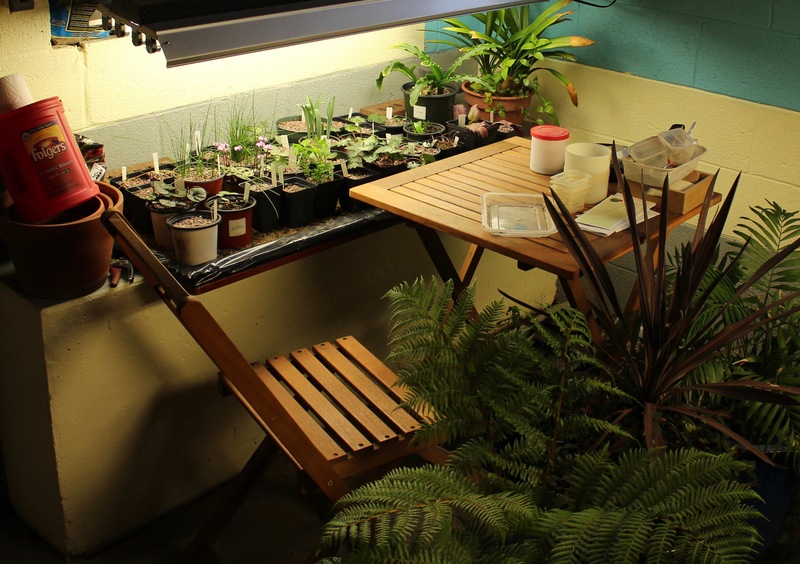 I’d probably make a practice of hiding out there… Hubby just added a second row of lights for me to maximize counter space in the shed, and I feel like a kid in a candy store selecting which plants (seedlings for me) to place under it. Haha, you’re right. That light space is always at a premium and fills up far too quickly. Usually the stuff which makes me so happy now ends up shoved in a dim corner by the time April rolls around… and that’s not the worst thing, but it sure would be nice to have room for everything. Hope you’re not getting too much snow out there! I’m with Lisa. I love reading your blog, esp. as i have family in Pa. and can picture the state unlike some places in blog-land. I love all the ideas and inspiration I get from reading blogs, even if I probably am not going to do anything as grand as your winter garden. And I really enjoy reading about your snowdrops, snowdrops visits etc. as I don’t know many (any??) local gardeners who have been bitten by that expensive bug. So I have to go online to get my fix from folks like you. Well that’s funny, and here I am thinking the same thing about there being nothing local and having to get online to get my snowdrop fix. I guess we’re all coming together to spread our plant obsessions! I was thinking about my “grand” winter garden the other day. As I was sitting there feeling as proud as can be I realized that none of the people who have asked to see it in person have ever asked for a second visit. hmmmmm. Maybe it’s not quite as impressive as I like to think! 34 bids? Dear god. I just spent a tenner on a single bulb and winced at that. I would miss you deeply if you stopped blogging. Keep going. Please. Gardening needs a lighter side. Plus I’ve learnt so much about accountancy..
I’m so pleased you were able to glean something out of my budgeting adventures. Trust me I won’t be doing that again! It’s so much easier to feel financially responsible and bare-bones frugal when there’s no ledger account staring back at you. 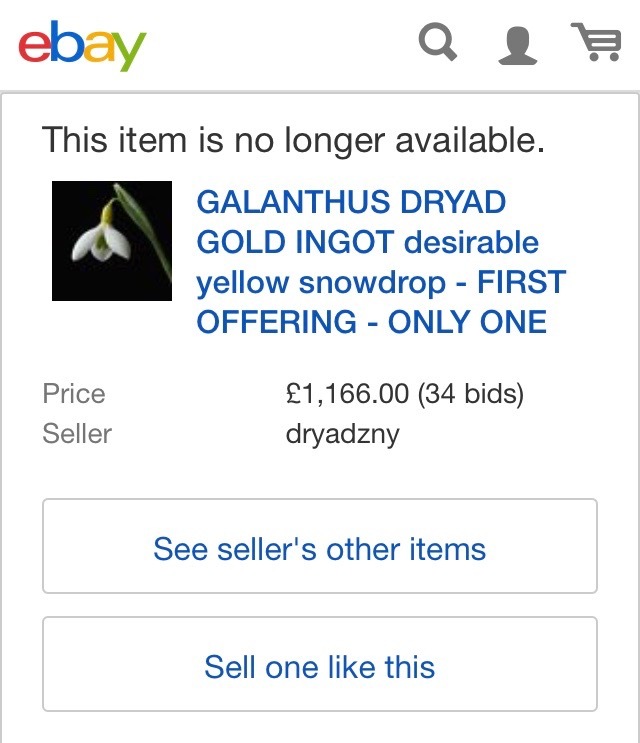 Still won’t be going (absolutely) nuts on the snowdrop purchases, budget or not. Keep blogging. You are an appreciated voice in our little community. That wall is on which side of your garden? It may not cast as much shade as you think. Is the “wall” really a berm? If not, how are they going to plant trees on top of it? The wall is more of a berm, just like The Wall is more of a barrier. It’s steep enough that you will struggle to make it up, but still plant-able. The top is about 10 feet wide before it drops off on the other side, and fortunately it’s to the West so only blocks the afternoon light. It’s good to hear from you Annette. I’ve been missing your posts here as well as on Facebook so I hope winter continues to work its way past your corner of the world. My biggest project is the huge mound which now runs along the back of the yard. The industrial park has put it in and will plant evergreens along the top in order to block the lights from their new parking lot. My goal is to plant all kinds of interesting things there and stealthily make it a part of my gardening territory, although it’s still not my property! Happy blogiversary! 🙂 (and I totally agree with you on “at least there’s no mud”) I noticed your ‘leaky foundation’ comment which immediately struck a chord because I have been dealing with the same thing under my house. Luckily I found the perfect person to work with (ex-Army Corps of Engineers) but that also means big $$$$ which needs to be done as soon as the weather allows. As Gilda Radner once said, “it’s always something..” What’s going on with yours? Underground spring or stream? Happy blogaversary! I always enjoy reading your blog. You know all the great sources for interesting bulbs, to the detriment of my wallet. How sad about your current view of the industrial park. I hope the evergreens will be a decent view and not block out too much sun! Winter is a time to be endured. Time to sort out the shed, plan and view blogs. Six years! And you are regular in posting, distinctive in your approach and you grow the plants I like. What’s not to like. By the way, your snowdrop section is super. I’ve made a decision to move as many plants as possible to the borders, and use a different compost for the planters. I’ve lost a few this year to a number of causes, mainly I think I should have completely changed the compost every year. And snowdrops are expensive beasts. Keep blogging. I like it.